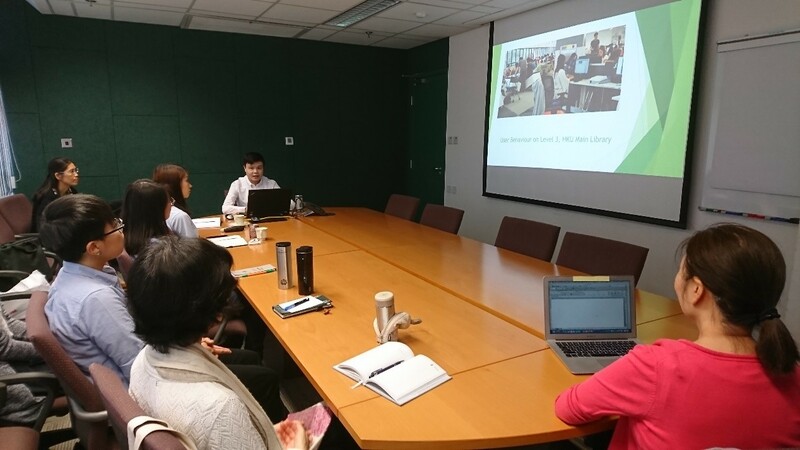 Wesley Cheng, MSc student in Library and Information Managment at the University of Hong Kong Faculty of Education, completed a summer internship with the Lending Services Division of the University of Hong Kong Libraries. He writes about his research project and internship experience in this HKLA News article! “What people say, what people do, and what people say they do are entirely different things”. This is a famous quote from Margaret Mead, an American cultural anthropologist, which simply means people may tell something different from their acts. Traditionally, surveys and questionnaires are the library’s main tools for collecting information from patrons. Nevertheless, these tools may not tell the whole truth. For instance, respondents might respond in a perfunctory manner, i.e. they just want to get a prize by filling in the questionnaire. Users do not think about how to improve library services; so why would you ask them this in a survey? So how can libraries supplement surveys to understand user behaviors and needs? User experience research can be the answer! The behaviors of library users, e.g. information-seeking behaviors, have changed and have also become incredibly complex. Hence, adopting user experience techniques is necessary. User experience research allows libraries to find out how users really feel. By conducting user experience research using ethnographic research methods, a more comprehensive picture of user experience can be given, which allows library staff to understand the library’s situation from the perspective of users. Moreover, by observing usage patterns through coding and data analysis, new ideas and suggestions for the library can be generated, which help contribute to the long-term development of library services. One of the objectives in HKU Libraries Strategic Plan is to “ensure inclusive and diverse physical and virtual environments that enable active, independent and collaborative learning”. Therefore, work has been continuously done to ensure that a good environment is offered to facilitate learning. For example, renovation work is being carried out on the ground floor and second floor of the Main Library; new zones like the Think Tank, Idea Corner and Innovation Centre are being constructed to support different user activities. As user experience research often involves observation of user behaviors, the results of the research can contribute to the planning and execution of renovation work and projects in a way that best suits the needs of library users. During this summer, I participated in the internship programme offered by the HKU Libraries, in which I was given the opportunity to work as a student intern in the Lending Services Division under the direct supervision of Ms. Melissa Man, the Assistant Librarian (Patron Experience). Instead of supporting the circulation duties which you might assume, I was mainly responsible for conducting user experience research for the HKU Libraries. Behavioral mapping, non-participant observation, card sorting and co-design homepage layout are the techniques chosen and applied. But you may first ask, what are behavioral mapping and non-participant observation? 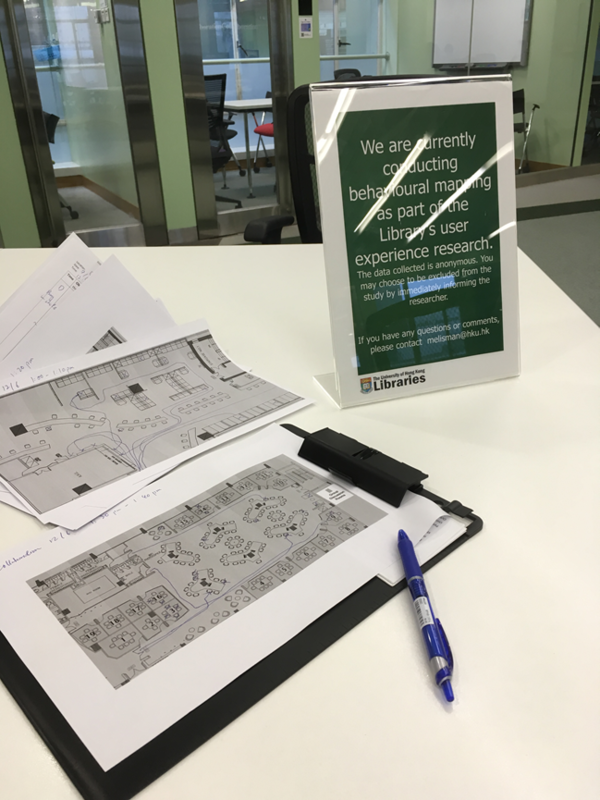 In short, behavioral mapping creates a visual representation of how library users move through and use library spaces, whereas non-participant observation takes note of how users behave in the library. Behavioral mapping records the locations and walking routes of users, while non-participant observation records the behaviors of users. The two major target study areas of behavioral mapping and non-participant observation in HKU Libraries are Level 3 of the Main Library and the Tin Ka Ping Education Library. These two spaces have finished renovation in recent years, e.g. Level 3 was turned into a learning common style facility in 2012 and comprises five zones (technology, collaboration, study breakout and multi-purpose). Nevertheless, this does not mean that these two areas are not subject to any changes anymore, as refinements and amendments like relocation of furniture and service points are still possible. In order to understand how library users are using the facilities, I collected data from June 2018, based on the research plan I designed and the study techniques that were already approved by the University’s Human Research Ethics Committee. The research plans consist of areas like research objectives, methodology and a research schedule. For both behavioral mapping and non-participant observation in HKU Libraries, a fixed time limit has been set for consistency of data collection, say 10 minutes for each mapping and observation conducted. Within the time limit, the walking routes and behaviors of patrons were recorded as much as possible. As library is a place of silence, patrons were not disturbed or interfered during the whole process. For behavioral mapping, the results would be viewed in aggregate. For instance, paths have been visually overlaid to determine heavy traffic zones versus underused areas. For non-participant observation, the process of coding and data visualization into charts and graphs have been done with the help of tools like Microsoft Excel and PowerPoint. Results of the five zones were compared and recommendations for improvement of the five zones were given based on the findings. After this first stage of my user experience research project, I presented the findings to library staff in August 2018. Library staff are very familiar with their users’ behaviours; but this was a good chance to share my systematically collected research findings. After conducting user experience research on the Library’s physical spaces, we turned our attention to the Library’s online presence: the Library homepage. 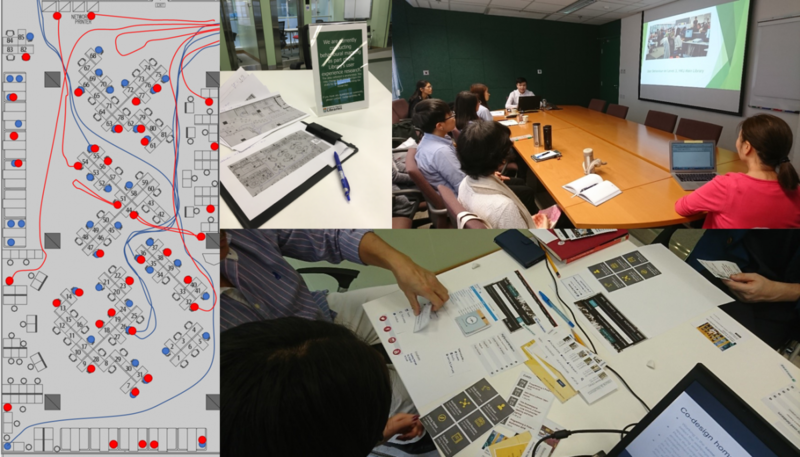 As HKU Libraries is planning to revamp its homepage, my supervisor and I wanted to learn more about how users interact with it. Nowadays, card sorting is a common method in obtaining user feedback. According to Goodson (2012), card sorting “allows users to impose their own organization on a set of ideas and works well for developing or evaluating website and menu structure”. 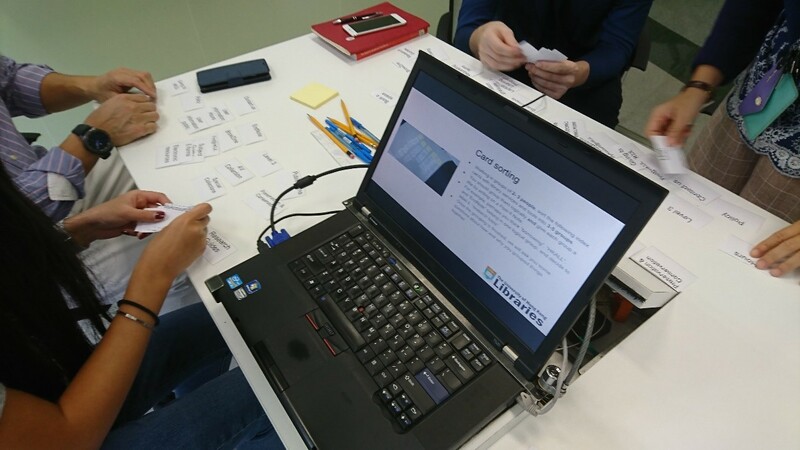 In a card-sorting usability test, each invited participant is given a number of cards. Each card is labelled with a heading from the library website, such as the name of a service (interlibrary loans, ordering forms) or individual content items (books, journals, or whole collections). Participants are asked to sort the cards into categories and then to label each category (Whang, 2008). Library staff would then ask participants follow-up questions based on their arrangement of cards. Goodson (2012) said card sorting is a low-cost and easy method for the librarians to gain insights in establishing standard language, as well as in deciding ranking and placement of entries within a given menu for the library website. In co-design homepage layout, website components (e.g. header, navigation bar and sidebar) of different websites are printed and distributed to participants. People are then asked to select their preferred layout of each website component and arrange them to create their ideal layout. As participants may choose their ideal website component based on visual presentation only, they are reminded that the selection should also be based on the information and features shown by the component. As part of my internship I helped to design the study, select the methodology, apply for ethical approval, and pilot test the study design. Currently, HKU Libraries is recruiting participants for a user study which will be held in early September, in which invited participants are asked to conduct two exercises: card sorting and co-design homepage layout. I hope the results of the study can help HKU Libraries to design a useful and user friendly homepage based on the research. I did a lot of reading about user experience research for my internship. I compiled the most useful and informative resources into an open Zotero Library, which I invite you to take a look at: zotero.org/groups/uxlibrariesresearch. You can view a list of relevant resources, as well as my own comments on each book, article, or website. User experience research is an effective and exciting way to learn about user behaviour. I encourage libraries to explore its potential! Andy Priestner, Matt Borg, & Heidi Steiner Burkhardt. (2016). 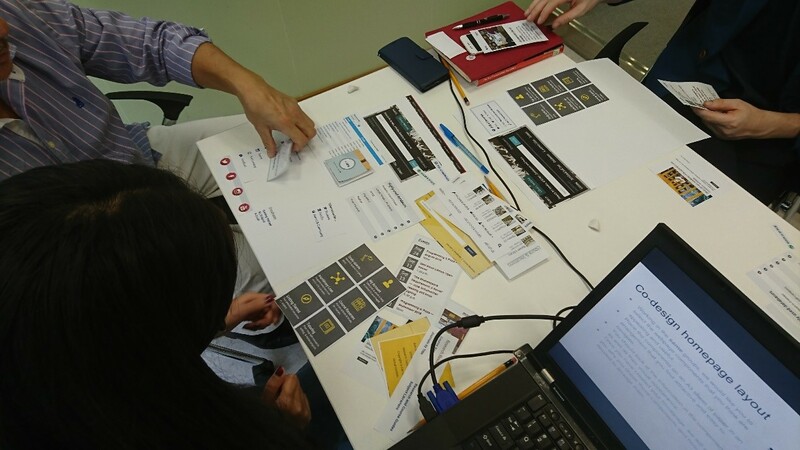 User Experience in Libraries: Applying Ethnography and Human-Centered Design. Weave: Journal of Library User Experience, 1(5), Weave: Journal of Library User Experience, 01 January 2016, Vol.1(5). Goodson, K. (2012). Using Card-Sorting to Arrange Menu Items on an Academic Library Homepage.